The reopening was made possible after appropriate landscaping and under specific rules. Therefore, a variety of limited musical events are held every year thanks to the collaboration of the Ministry of Culture, the Municipality, the Association “Friends of Music” and the ones responsible for the maintenance of the monument Panel. So, in July 1995, a variety of four festival events was launched and was given the name “Musical July”. The prestige of the festival, the sacred place and the beauty of the landscape left the audience in awe, resulting in attracting many festival sponsors and as a result leading to self-financing and hosting four weekends of musical performances every July. 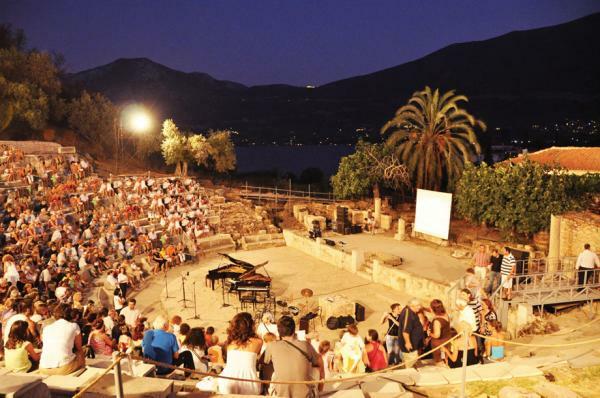 Until 2002, the artistic events were under the responsibility the Association “Friends of Music”, which was then brought under the aegis of the Hellenic Festival. In 1998, the “Association of Friends of Music” with the collaboration of the Municipality and the Ministry of Agriculture started the Festival of Agrotourism, where local agricultural products and handmade crafts are exhibited into the open market. It is undeniable that the “Musical July” has made an important contribution to the dynamic culture of the area.